PHILADELPHIA – The big man left his feet. That is all you need to know. When Jeremy Maclin caught a 1-yard touchdown pass from rookie Nick Foles with no time remaining to give the Philadelphia Eagles a 23-21 victory over the host Tampa Bay Buccaneers last Sunday, 54-year-old Andy Reid literally jumped for joy. It was a giddy reaction, especially for someone who has won 140 games as an NFL coach. Despite a 4-9 record that includes an eight-game losing streak, despite the personal tragedy of his son's death this summer, despite 14 years grinding on the job in Philadelphia, despite all signs pointing to Eagles owner Jeffrey Lurie firing him at the end of this season, Reid still wants to coach and doesn't want to take any time off. "That's not where I'm at," he said Tuesday when I ran the idea of a one-year sabbatical by him as he left the practice field following a midday walk through in preparation of Thursday night's game against the Cincinnati Bengals. "No. Listen, I'm a coach. I don't hide that from anybody. This is what I do. And I enjoy doing it. I love every day of it. I sure like winning more than losing, but I also am very privileged to be a coach in the National Football League." So, if Lurie decides to move on, Reid will be eager to move quickly, ideally to the next head-coaching opportunity that awaits him. Though coaches like Mike Shanahan and Jeff Fisher have seemed to enhance their marketability after taking a year off and have come back recharged and with control of their respective front-office destinies, Reid expresses no desire for rest. "No, I've got the energy," he said. "The energy is there. Listen, you'd have to talk to people around me. I'm not gonna sit here and … you know how I am. I keep my energy level up. I enjoy what I'm doing." Some sources familiar with the Eagles' organizational mindset believe it's possible that Lurie, despite his preseason decree that Reid would have to improve on last year's 8-8 record to receive a contract extension, could relent and decide to retain Reid, particularly given the potential flashed by Foles since the rookie replaced the injured Michael Vick last month. "After his son died, I thought maybe [he needed a year away]," Eagles tight end Brent Celek said. "But he's still really into it. He wants to win a world championship. Not only does he want to win one, but he wants to win one in Philly. He wants to be here. I feel like he's hungry. That's why you saw him get so excited [after the Bucs game]." If Reid is fired, he's expected to draw interest for other head-coaching openings. With San Diego Chargers coach Norv Turner and general manager A.J. Smith reportedly on their way out, Reid, who grew up in Los Angeles and owns a home in Southern California about an hour's drive from Qualcomm Stadium, is viewed as a potential target of owner Dean Spanos. Given the expectation of numerous firings around the league, Reid may have other options as well. In the meantime, for all the frustration his team has experienced over the past two seasons, many of Reid's players still marvel at his intensity, enthusiasm and work ethic. 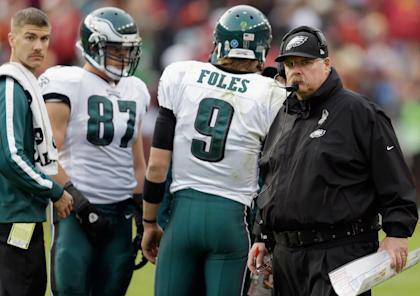 "Andy Reid is a true professional," guard Evan Mathis said Tuesday. "One thing about him is, no matter what's going on outside, he's the kind of guy who can stay focused. If there's any kind of pressure ever applied from anywhere, Andy's the guy who stays true to his course and doesn't panic like some would under pressure." Veteran quarterback Trent Edwards, who signed with the Eagles last February, said that if one were to have walked into a Wednesday team meeting during the Eagles' eight-game losing streak, "It'd be the same as a Wednesday meeting in Week 1. That's his mentality. I'd say, if anything, he's more into it now. That, for me as a player, is the best thing. Sometimes, when teams start to lose, players start to check out a little bit, and maybe the coaches do too. Not here. No one's checking out as long as he's here." Surely, there is a lot to deconstruct about the past two seasons, and much of the blame can reasonably be pointed in Reid's direction. After a promising 2010 campaign that featured Vick's unlikely revival and a narrow, first-round playoff defeat to the eventual Super Bowl champion Green Bay Packers, Reid and general manager Howie Roseman employed an aggressive approach that, in retrospect, adversely affected team chemistry and performance in 2011. After signing a slew of high-profile free agents, the Eagles picked up a 'Dream Team' tag that haunted them through a season of underachieving. Reid's decision to fire first-year defensive coordinator Sean McDermott and replace him with his close friend and longtime offensive line coach, Juan Castillo, was an unorthodox one, and it may have hurt Philly on both sides of the ball. Castillo was fired six games into this season. Howard Mudd, the man who'd replaced Castillo as the offensive line coach, has been viewed internally as a major disappointment. And defensive line coach Jim Washburn, hired after the 2010 season, was a loud, disruptive presence who was finally dismissed by Reid earlier this month. Asked if he regretted having fired Castillo –the Eagles' defense has struggled mightily since Todd Bowles was named defensive coordinator in mid-October – Reid said, "Juan's a good friend and a heck of a football coach. There are a lot of things that go into all that, but Juan's gonna coach a long time, and at a very high level." Possible translation: When Reid gets another job, Castillo may well be his offensive line coach. It's less likely that Vick, who can be released by Feb. 6 without any salary-cap ramifications (otherwise $3 million of his $16 million salary for 2013 becomes guaranteed), would play again for Reid, though stranger things have happened. Vick, who was unavailable for comment, has told friends that he understands the coach's recent decision to name Foles his starter for the rest of this season – Vick was recently cleared to return to practice in the wake of a concussion suffered last month – and is eager to start for some NFL team next year. 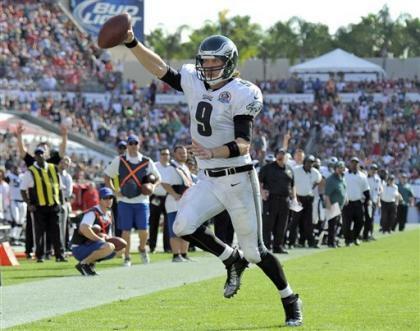 For now, however, all eyes are on Foles, a third-round pick out of Arizona whose 381-yard passing performance against the Bucs was made abundantly sweeter by that last yard: Earned on the fourth-down, final-gasp throw to Maclin that made Reid tap into his inner child. "This is what it was: It was a great game," Reid said. "You put the records aside. Every game, you get caught up in it. I mean, you're into it. And then to have a game like that. I mean, I've been coaching a long time. I haven't had a lot come down to having to score a touchdown. A field goal, maybe, but a touchdown with two seconds left to win the game? How can you not love those? "So that was just an exciting, exciting game, the ebbs and flows of the game – going up, and then you're down, and then you come back, and then you have a chance to win it on the last play with two seconds left. Heck of a deal, walk-off type game, that's awesome." Said Mathis: "People were talking about it, how the coaches were celebrating. I felt how they felt. We needed that so bad." And while Reid may not have many more chances to win games in Philly, some of his players are hoping reports of their coach's demise have been greatly exaggerated. "God, I want him back," Celek said. "He deserves one more year. I mean, our whole offensive line got decimated." Said Maclin: "I think Coach Reid loves what he does. I'm a Coach Reid guy. I'll go to bat for him always. I love playing for him. Hopefully, I'll continue to play for him." Added Edwards: "I hope he's still here next year, and I've loved every minute of playing for him. He's a tough coach, but he knows how to coach people, especially the quarterback position." If Reid has his way, he'll be coaching some NFL team in 2013. And let the record show that, as he fights his way through the end of an unsatisfying season in Philly, he has lost neither his energy nor his sense of humor. When I asked Reid if he relies heavily on coffee or like substances to get him through the long days and nights, he replied, "You know, I don't drink caffeine." He fell silent for a couple of seconds. "I eat a lot," Reid added. "That counts, right?"